American Folklore abounds with heroes and heroines -- Davy Crockett, Pocahontas, John Henry, Betsy Ross, Paul Bunyan, to name a very few. Some of their stories are indisputably factual -- others, well, let's just say Americans have never let historical accuracy crowd out a good story. Most of our tales of folk heroes, though, do tell the truth about Americans -- we are a people who love to see ordinary persons do extraordinary things. What a shame -- and how unAmerican -- it would have been had Holt Collier been lost to history, which, he almost was. Born a slave in 1846 on a Mississippi plantation, bear hunter Holt Collier led a life of adventure that included a stint as a Confederate cavalry scout, wild-west-style gunfights, and hunting trips to Mexico and alaska. Collier is remembered in his native state to this day for the role he played in President Theodore Roosevelt's 1902 Mississippi Delta bear hunt that resulted in the naming of the Teddy bear, a tale recounted in Jim McCafferty's children's book, Holt and the Teddy Bear. Holt and the cowboys recalls a lesser-known tale from Holt's exciting life, but one that is every bit as interesting and entertaining. In the days following the Civil War, Holt traveled to Texas where he applied for a job on a cattle ranch. The ranch foreman, intending to play a cruel joke on Holt, offered Holt work if he could prove he could ride a certain horse. Unbeknownst to Holt, the horse the foreman had in mind was Old Hurricane, the meanest, most unrideable, buckingest mustang in that part of Texas. Unbeknownst to the foreman, however, Holt was a horseman of vast experience. The book tells how Holt outsmarted both the foreman and Old Hurricane and, in the process, won the job -- and the hearts and friendship of the cowboys on that Texas ranch. Holt's work as a Texas cowboy now has been memorialized in the Waco, Texas, sculpture project, Branding the Brazos, at that city's Indian Springs Park. The group of massive bronze sculptures depicting three mounted cowboys driving a heard of longhorns, erected in 2014, includes one 14 foot tall statue of a black cowboy on horseback. According to Texas artist Robert Summers, who created the works, he modeled the statue of the black cowboy after Holt Collier. Holt and the Cowboys is written for children in the lower elmentary grades. 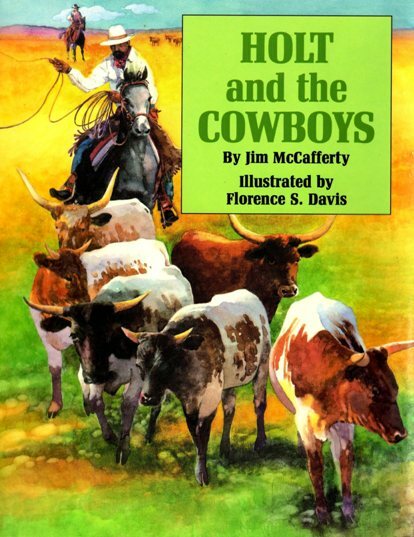 Both Holt and the Cowboys and Holt and the Teddy Bear are recipients of the National Christian Schools Association [NCSA] Children's Crown Collection designation, an annual listing of twenty children's book titles recommended by the NCSA "because they are well-written, they promote strong values, and they contain positive and uplifting themes," according to librarian Sandra Morrow, who established the Children's Crown Collection program in 1992. Follow this link for ordering information: Buy Holt and the Cowboys. Besides Holt and the Cowboys, Jim McCafferty is the author of The Bear Hunter: The Life and Times of Robert Eager Bobo in the Canebrakes of the Old South and the children's book, Holt and the Teddy Bear. The Kindle version of The Bear Hunter can be previewed and purchased here. Follow this link for ordering information on all three books: Buy the Books.